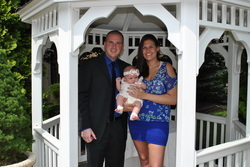 This beautiful baby welcoming ceremony with a water blessing, was held at The Windsor Ballroom's garden gazebo. Welcome friends and family! Today is a very special day for all of us. It is a day in which we celebrate the birth of this child Savannah Raen. What you are all about to witness here today is truly a celebration of love, and of life! As Savannah is here today, she is new and perfect, with no need of fixing nor cleansing. She is a gift. Her smile, her laughter, and her presence enrich the lives of all who know her. Less than half way through her first year here, 3 months old, and already she has made the world a better place. This child is our future and represents the light of the world. Shawn & Samantha have honored all of you today by inviting you to not only witness this beautiful welcoming ceremony, but most importantly, to participate in the blessing of this child. This event is also shared by those who have passed beyond this life. Their roles in the lives of Samantha & Shawn are gratefully remembered. They acknowledge and honor the bloodlines, the history and the people who have all gone into the creation of Savannah. They remember what it felt to be with these loved ones, and that through shared memories Savannah may come to know her ancestors and the lineage that is her birthright. Today we simply give thanks and celebrate all the many wonderful blessings Savannah brings, and do our best to remember, and be thankful for, the very special role that we all have in her life. And one which they earns for themselves. What name have you chosen for your child? Ladies and gentlemen, I am now going to ask Shawn & Samantha to make promises as parents in front of you, their family and friends, as such those who mean the most to them in the world. Do you promise to nurture and protect Savannah throughout her life, promise to support and offer her guidance in the choices that she will make. Do you promise to teach Savannah right from wrong, to enable her to make her place in society as a kind and caring person? Do you promise to teach Savannah to celebrate diversity, never ever being aware of prejudice. Knowing no boundaries, to be loving of all that surrounds her in her life, and celebrate the similarities and differences in our world? (Parents respond): We do. We promise to be the best parents we can. And may all the wishes you wish come true. (I will address Savannah and I will use the blessed water with roses to bless the top of her head, her forehead, her heart, both her hands and both her feet). I congratulate Shawn & Samantha on the birth of their beautiful baby girl. May her life be filled with the good things of life, and in particular with the love and laughter of those who make up her world. With abiding confidence and affection, we send you forth on your journey of life. May you be filled with thanks and wonder, humor and fun, hope and perseverance so that you may grow in wisdom and grace.